VGBA is a free Game Boy Advance emulator developed by Chaudis which can help you play the Game Boy Advance games on your Windows 8 and 8.1 computer system. This emulator app is small and compact which is bundled with different features and options. VGBA starts with a simple black screen having different options displayed on it. There are different menu options that help you take actions in VGBA, these options include load ROM, stop ROM, reset, pause, turbo mode, manage cheats, load state, select state and save state. You can load different Game Boy Advance ROMs by clicking on Load ROM from the menu. VGBA comes with one ROM, to load ROM from a different location from your hard drive then you will have to click on s small plus button near ROM directories and then browse for the location where you have the ROM to play. 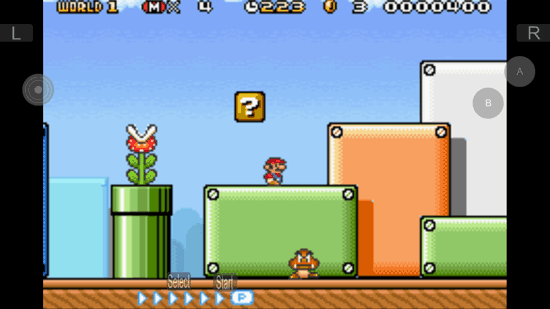 The game can easily be loaded from the added ROM to the VGBA. The game plays in the same environment like you would play in a Game Boy Advance. The game you will play on this Game Boy Advance emulator, it will be played using the keyboard keys like A, W, D and the arrow keys. Although the keys may differ from one game to another. You can end the game whenever you want to by clicking on Reset. The game can be easily saved and loaded by using the menu options for the same. The graphics displayed on the VGBA are same like they would look on Game Boy Advance. There might be slight difference as compared to the original games on Game Boy Advance because VGBA is a virtual Game Boy Advance emulator and not really a physical Game Boy Advance. 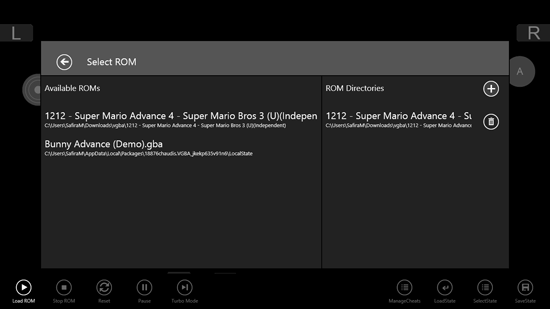 It is important to keep in mind that the loaded and saved games from the emulator are saved in the same folder as of the original folder of the ROM loaded in it.